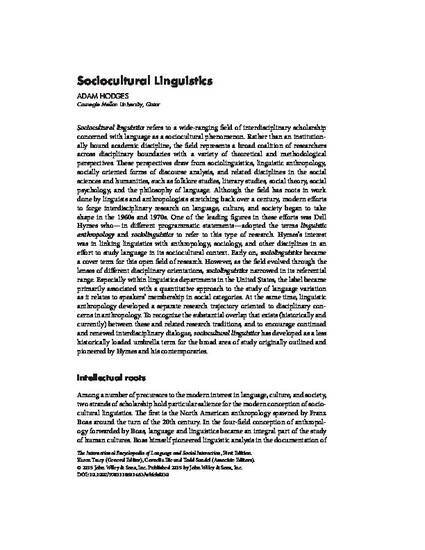 Sociocultural linguistics refers to a wide-ranging field of interdisciplinary scholarship concerned with language as a sociocultural phenomenon. Perspectives draw from sociolinguistics, linguistic anthropology, socially oriented forms of discourse analysis, and related disciplines in the social sciences and humanities, such as folklore studies, literary studies, social theory, social psychology, and the philosophy of language. This entry traces the historical development of the field, including discussion of key figures and their scholarly contributions. It then outlines key themes and ideas central to ongoing research concerns. Access online at http://onlinelibrary.wiley.com/book/10.1002/9781118611463. The International Encyclopedia of Language and Social Interaction. Karen Tracy (Editor), Cornelia Ilie (Associate Editor), Todd Sandel (Associate Editor). ISBN: 978-1-118-61110-4l / 1660 pages / May 2015, Wiley-Blackwell.